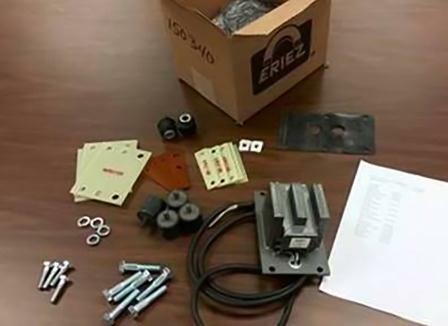 Eriez offers spare parts kits for various light- and medium-duty vibratory feeders. Eriez now offers spare parts kits for various light- and medium-duty vibratory feeders utilized in an array of processing applications. The company stocks these kits for immediate shipping, enabling customers to quickly and easily rebuild an applicable compact vibratory feeder in a shutdown or emergency situation. These spare parts kits contain everything necessary to rebuild most Eriez Model A, C, High Speed (HS), and High Deflection (HD) vibratory feeders. A typical kit includes a corded electrical assembly, diaphragm, shock mounts, elastomers (HS versions), tuning springs (front and back), spacers, and associated hardware. These light- and medium-duty vibratory feeders--with totally enclosed patented magnetic drives--can feed practically any bulk material from micron size to bulky chunks. Solid-state controls operate the feeders with “watch–like” precision. Standard models are offered for the majority of feeding applications. Special units such as multiple drives, enclosed trays, or screens can be designed to handle users’ specific application challenges. In addition, a wide variety of standard and special trays are available.